Things Wot I Have Made: What to Do With Tension Squares? What to Do With Tension Squares? Autumn is coming. It's time for a cardigan. 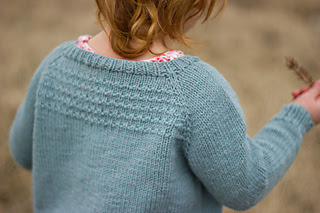 Granted, a small one for a toddler so that I can spot the knitting disasters sooner and have less to unravel when it all goes horribly wrong. But a cardigan nonetheless. 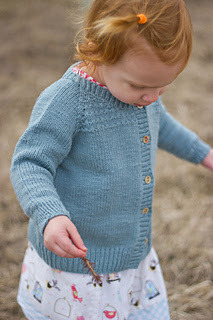 Here's the pattern on Ravelry, the ever-so-sweet, slightly 1950s retro Cricket cardigan by Melissa Schaschwary. 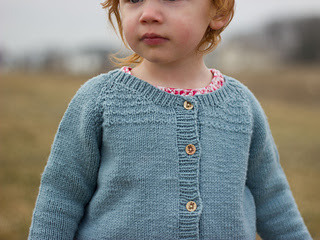 And I'll be making the cardigan out of the pale blue. It's at this point I have a confession. All those hats and scarves of from the past... Yeah... I've kind of just thrown myself into them without bothering with a tension square. Bad, bad habit I know. Thus I've made two tension squares before starting the cardigan so that will be one less chance of mucking up the project. But what's the best bit? During a soggy afternoon with an energetic toddler I found a use for the squares. Ready? House and Garden, World of Interiors and Elle Decor, eat your respective hearts out for your eyes do not deceive you. That is indeed Upsy Daisy from In the Night Garden fame, snuggled up under a blanket of cloudy softness that makes one sigh. Behold! the other square is a rug beneath a Philip Starck-inspired chair and coffee table made out of a toilet roll. The other half of said roll is Upsy Daisy's bed. Her abode? A bit of book case. One bijoux, impromptu apartment for a plastic figurine. One happy toddler. One mother, surprised at her creativity under pressure. Ha! That is one chic doll. And what a find in your mum's cupboard. I don't knit tension squares for hats either, but they're definitely essential for anything bigger. Oh lord I've never done a tension square either, but I think I've only knitted small things like hats, scarfs, gloves, and plushies. I have a kit to make a top and I think I'll have to do it for that bad boy. Best of luck with the top. I have had a moment of inspiration regarding the fate of tension squares beyond the bijoux apartment of small toys... gather up enough of these odd patches and you've got yourself the most curious building blocks for a rather wibbly blanket.